I enjoy making custom order diapers for clients, because it gives me a chance to do some fun combos I might not ordinarily offer as a stock item. I just mailed off a great AIO, and it came out so cute I had to share it here! Please use the comment section to let me know if you love it too! All styles can be created as an AIO (all in one) or as a cover; it’s worth noting that cloth diaper covers make excellent swim diapers to coordinate with your child’s suit. 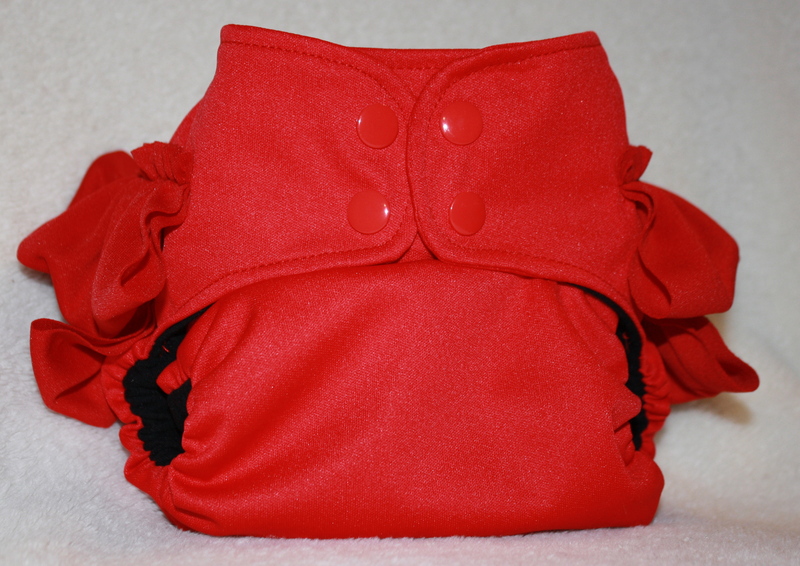 Here is is, check out this awesome Red Ruffle Bottom diaper! What a great compliment to any modern girl’s wardrobe. This Ruffle Bottom AIO featured an organic bamboo fleece soaker, covered with cotton to coordinate it with the cotton lining the inside of the diaper. My semi attached soakers are securely attached at one end (at the back for girls, at the front for boys), and a generous length, allowing for them to be folded to double the absorbtion in your babies wettest area, without adding bulk to the entire diaper. This soaker is 2 layers is the lower 2/3, allowing for 4 layers of bamboo fleece (and plus 4 additional layers of cotton) in the wet zone, while keeping it trim elsewhere. 10 columns of snaps across the waist give a close fit, and horizontal rows of snaps create 3 rise options. This picture shows it on it’s smallest settings. To order a custom diaper in this combination, or to see what colors are currently available to make a unique cloth diaper or cover for your son or daughter, you can contact me using the form below. I also can be reached through my etsy store, or via email at Susie@FreeRoseStudio.com As always, thank you for taking time out of your day to support Free Rose! !